For program details, please download Short Course Abroad 2015 Information below. 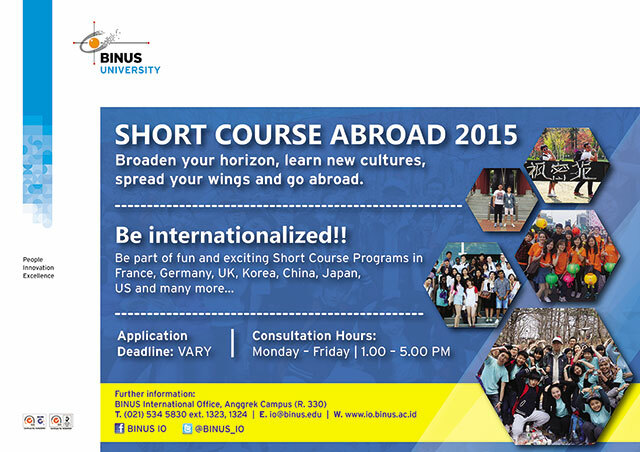 Get all the information you need about the program in the Short Course Abroad 2015 Information above. For BINUS Application Form, please submit to IO at Room 330, Anggrek Campus. A: We cannot waive your attendance if the program clashes with your class schedule. However, if the short course program includes these dates: 29, 30 June and 1 July, you can still join the short course program. If you have final exams during these dates (29, 30 June and 1 July), you can take your final exam during Semester Pendek (SP) Final Exam period scheduled tentatively on Aug 27- Sept 2.